If applicable, NIH grant number of project and name and contact information of project’s NIDA/NIH Program Officer. If a non-NIH grantee, no information on Program Officer and grant number is required. Calculate required amount of NRCs for your project and submit your request well in advance of your planned experiments or tasks, or 6‑8 weeks prior to depletion of stock on hand for ongoing studies/tasks. Justification for the quantity needed. If the request is related to a previously submitted protocol, provide a reference to this protocol and a brief statement of progress along with references to resulting publications. A timeline indicating approximately when and what quantities of NRC shipments are needed over the duration of the protocol. 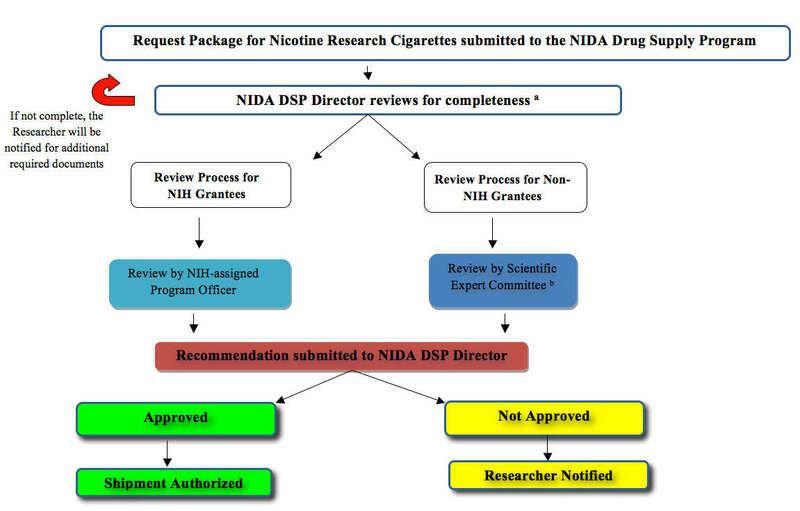 Statement of commitment that NIDA will be acknowledged in research publications using the NIDA-supplied cigarettes. Investigational Tobacco Product (ITP) application information including: A copy of FDA letter (Advice/Information Request) in response to your ITP application. (NOTE: Suggested guidelines for submitting an Investigational Tobacco Product Application (ITPA) to FDA/CTP(PDF, 983KB) are given separately. A copy of the document demonstrating that the research is approved by the Animal Care & Use Committee and that adequate care in conducting animal research will be exercised. For more information, please visit the Animal Care & Use Committee Animal Study Proposal website. Reference information pertaining the previous protocol1 / FDA approval to the previous protocol (if applicable). Failure to comply with aforesaid guidelines is likely to delay the processing of your request. a For more information, about the Investigational Tobacco Product (ITP) application, please refer to the Ordering Guidelines for Nicotine Research Cigarettes. All requests/questions should be sent to: NIDANRCSupply@mail.nih.gov. Please specify substance requested in the subject line.